American Airlines may require its pilots to undergo additional training before flying the Boeing Max aircraft, the largest U.S. carrier said on Monday, a step beyond what other airlines and the Federal Aviation Administration currently mandate. The Max fleet is grounded in countries across the globe after a jet operated by Ethiopian Airlines crashed in March, the second involving the plane in five months. Following the first incident – which involved a 737 Max flow by Lion Air – Boeing and the FAA issued notifications to carriers that reinforced protocols already in the flight manuals. American also provided supplementary information to its pilots, a spokesperson said, and is considering additional steps. “As a result of the continuing investigation in to both aircraft accidents, we are looking at the potential for additional training opportunities in coordination with the FAA and Allied Pilots Association,” the spokesperson said in an emailed statement. A spokesperson for United Air Lines, one of the other major domestic airlines that fly the Max, did not immediately respond to FOX Business&apos; inquiries as to whether they would follow American&apos;s lead and require additional training — first reported by the Wall Street Journal. A Southwest spokeswoman said the company invested in a Max flight simulator that will be operational in the second half of 2019. "We continue to await FAA and Boeing guidance on any additional training and software enhancements. 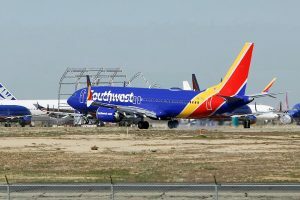 Safety is the top priority at Southwest, and we will continue to work closely with Boeing and the FAA to maintain and enhance the integrity of our fleet and our operating practices," she said in an emailed statement. Boeing is continuing work on a software patch to address the underlying issues that led to both crashes, largely fixing the so-called Maneuvering Characteristics Augmentation System (MCAS) that is supposed to automatically correct the angle of the jet on takeoff to prevent stalling, to provide pilots greater control instead. The timeline for submitting the fix to the FAA was delayed to give Boeing more time to identify and address all pertinent issues, including a second software problem uncovered as part of the review, the agency said previously. U.S. airlines, including American, have been forced to cancel hundreds of flights daily as a result of the grounding. The Dallas-based company on Sunday said it would extend the interruptions until Aug. 19, impacting roughly 115 flights a day during the busy summer travel season. “We remain confident that the impending software updates, along with the new training elements Boeing is developing for the MAX, will lead to recertification of the aircraft soon,” American Airlines CEO Doug Parker and President Robert Isom said in a statement.